Pour the cream into a large pan. Then, sprinkle the gelatin on top of the cream. Do not stir. Let it dissolve for 10 minutes. Next, place the pan on the stove-top and turn the heat to medium. Begin to stir the mixture. Once the cream is warm, add the sugar and peppermint extract. Do not let the mixture boil. Continually stir the cream until the gelatin dissolves completely. It will look clumpy at first, but do not fear. Continue to stir until the cream is smooth. Pour the cooked cream into a serving bowl, cover and refrigerate at least six hours before serving. 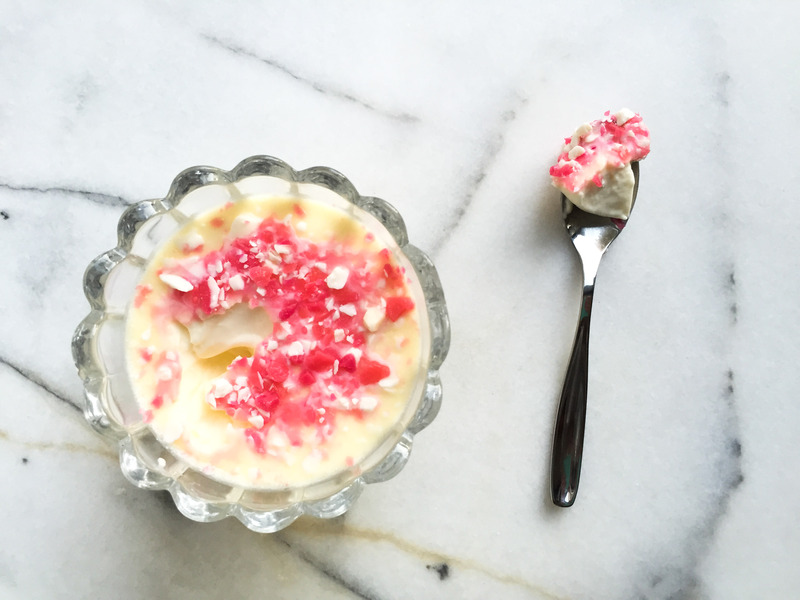 Once the panna cotta is set, serve cold and top with crushed peppermints or dark chocolate chips. This entry was tagged christmas dessert, dallas food blog, dallas food blogger, dark chocolate chips, dessert, panna cotta, pannacotta, peppermint, peppermint panna cotta, peppermint pannacotta, texas food blogger. Bookmark the permalink.